Spondylosis or spinal osteoarthritis can cause degeneration in the vertebral column. 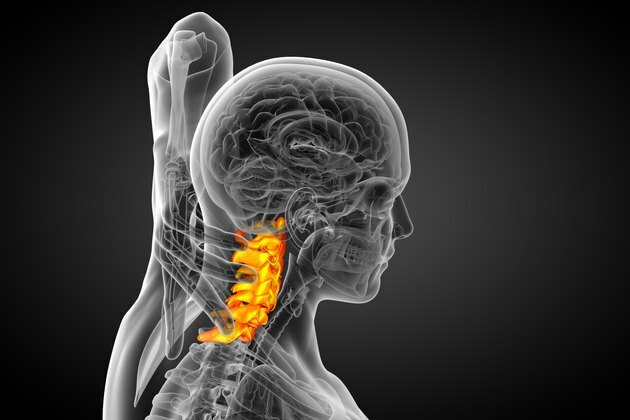 When this occurs in the cervical area of the spine, it can result in neck and upper back pain and stiffness. Spondylosis can also lead to foraminal stenosis, which is narrowing of the nerve canals or openings in the spine, as described by a study published in "The Spine Journal." Exercises that are formulated to stretch and strengthen the spine and muscles of the neck help to alleviate compression of spinal nerves and chronic pain. They may also help to prevent further damage to the bones, nerves and discs of the vertebral column as part of a treatment plan. This simple neck exercise is recommended by Dr. C.A. Jenner, MBBS, FRCA, a pain specialist in London, U.K., to stretch and strengthen the muscles of the cervical spine. While standing or sitting up straight, slowly bring your head forwards so that your chin touches your chest. Then raise your head slowly to the upright position for repeat five times. Extend your neck by lifting your head back so that you are looking up at the ceiling. Relax and repeat this exercise five times. This physiotherapy exercise is recommended for neck pain and tension. To perform the neck rotation, stand or sit upright and slowly turn your head to one side. Perform five rotations to each side. To do the side flexion, face forward and slowly bend your neck so that your ear is dipped towards your shoulder. Repeat five times on each side. Do not move your head anymore than you are comfortable in any of these exercises. Dr. Jenner also recommends shoulder exercises to stretch and strengthen the muscles of the upper back and neck. To perform the shrug, simply lift your shoulders as far up as possible while sitting or standing upright. Relax and repeat 10 times. To do the shoulder retraction, begin by moving your shoulders forwards as much as possible, then move them back as far as possible. Relax and repeat five to 10 times. This exercise helps to strengthen the neck extensor muscles and the muscles of the upper back and shoulders. To begin lay on your back on a floor mat. Then bend your knees so that your feet are flat on the mat. Lift your buttocks and lower back of the floor and raise your chest upwards using the upper back and neck muscles. Hold this position for five to 10 seconds, relax and repeat up to 15 times. Are There Exercises to Correct a Humpback Posture?